Monday morning, 1992, 6:30 clock. Once again the alarm disturbed me in a beautiful dream. But not too soon. 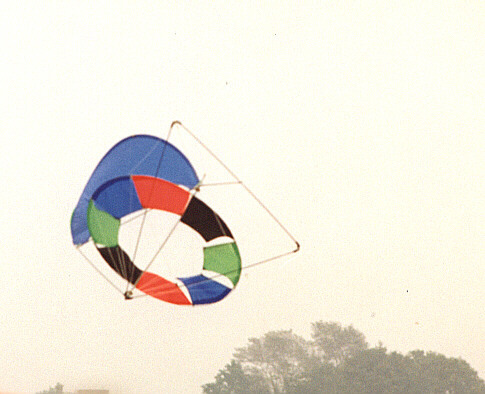 A dreamkite was already in my head: A narrow ring of individual segments, which turned in flight. From the physics lectures this morning, I have heard not very much. In my book were more kite sketches than formulas. But it was obviously not so easy, to build the dreamkite. The first thought was in the direction to arrange the spars like a star. But the first problems appeared already in the sketches: I had no possibility to build a stable star structure, because I do not have connectors and I have not seen a good way to fix the bridle. The second thought was, to clamp the segments in a ring, and let this ring slip on small rolls on a outer construction. After school I started to build the ring with the segments. Because I had nothing else than electron tubes and foil of garbage bags, the ring was built of this. But the whole structure reminded more to a wet cloth, than a stable kite disk. But then came the saving idea: A spar through the middle of the disk and lines from the ring to the ends of the spar. It was now surprisingly stable. Now I had only to find a outer construction to fix the bridle. Without rotation, the placement of the bridle would be no problem, but I now wanted a rotating kite. The nearest was then, to build a similar construction like the rotor: a ring and lines to the end of the spar. In this ring I have put the rotor and the lines of the rotor are fixed at a bearing of wood parts. I wanted to attach the bridle on the first flight. But this had to wait, because now it was winter. In the spring was in our neighboring town (Donaueschingen) a kite festival. So I went with my all kites to the festival. I still not tested new construction, which heard for me on the name "UFO", I packed also into the car, which was a bit difficult because it was not very small. It was the in our area almost normal wind force: no wind. I built up the UFO, because I had nothing else to do and I also knew nobody from the other kite clubs, because it was my first festival. I Have not thought, what a sensation my kite was already on the ground. I would just like to know how many meters I film this construction has on its conscience. I was a little bit shocked because of this big interest and so I asked some other kite flyers, if there is a possibility for a patent protection for such a construction. Meanwhile I have a patent on my kites. On the evening the wind refreshes and the first flight tests were possible. But the kite just moved to the side, and the size, at least 4m in diameter and 2m high, was very unwieldy. 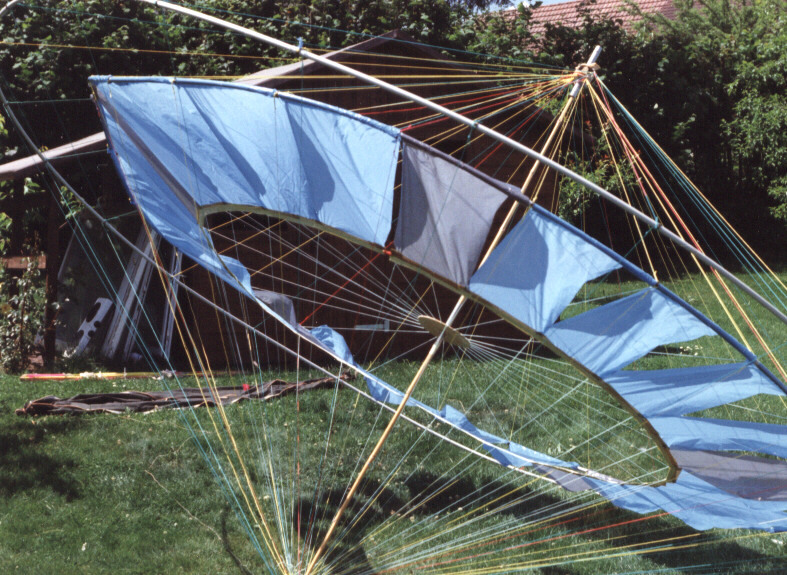 Next, I built a smaller version with 1m diameter, composed of Carbonfibre and spinnaker. By a slight change in the sail profile, I could prevent that the kite moves to the side. Now I could hold the kite in the air with three lines, but only for a few seconds. 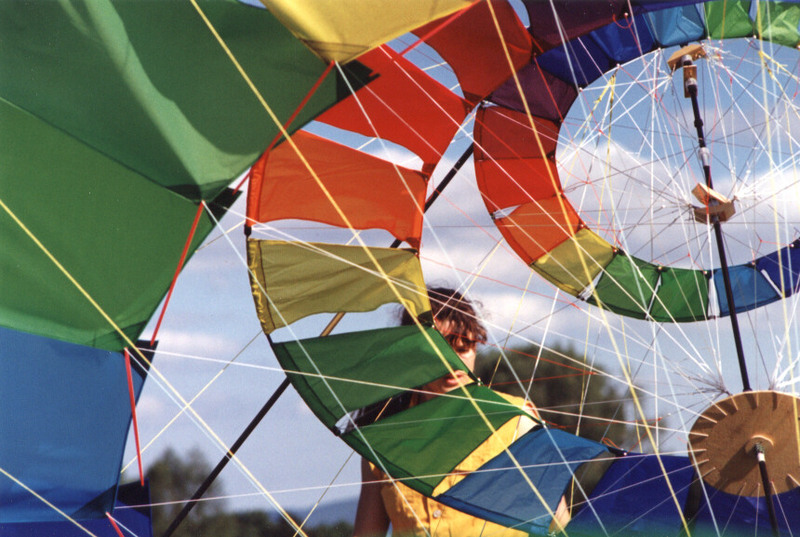 Then the kite started to spiral to the ground and no controlled steering was possible. In the summer holidays at the Baltic Sea I could improve the steering of the kite. The three lines were reduced by a bridle to two, but the ends of the lines must be mounted on a 2m handlebar. A stunt flight was still not possible with the handlebar of the kite, I could just hold the balance. Through a tip from another kite flyer at the festival in Aalen, I finally became the idea to stabilize the kite with a vertical wing. Now was also stunt flying with two normal handles possible. After a flight break, because it was already winter, I tried to let my kite fly as a singleline kite. This was surprisingly easy with a little change to the wing. Now I wanted to bring the first (too big) kite also a singleline kite in the air. It was build completely with Carbonfibre and equipped with a wing. But the first flight test in Kamen ended very quickly with a spar salad, because the carbon on the rings was unfit and broke. It was again a change necessary. The inner ring was constructed from fibreglass, and the outer ring has been replaced by a simplified structure made of Carbonfibre. But then I had to wait for missing material. 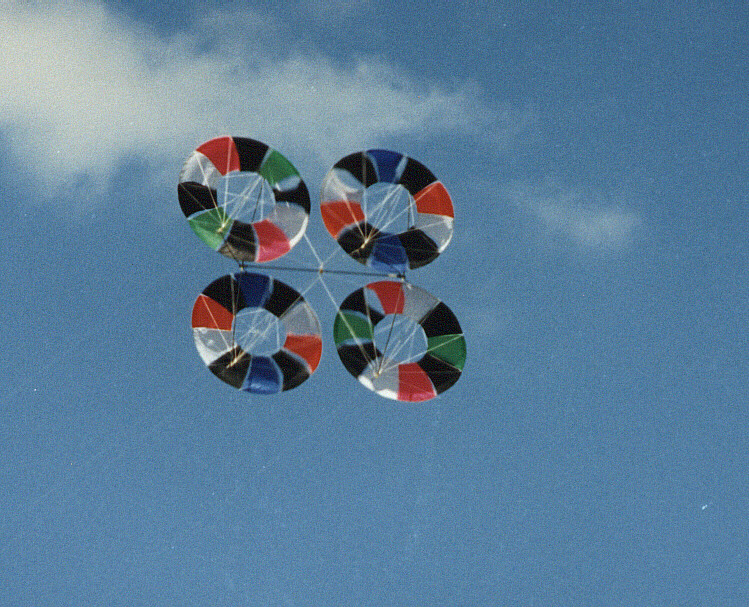 In this time I wanted to build another kite, which consists of four rotors. During the construction, I had seen, that the two halves of the kite could turn on a centre point. 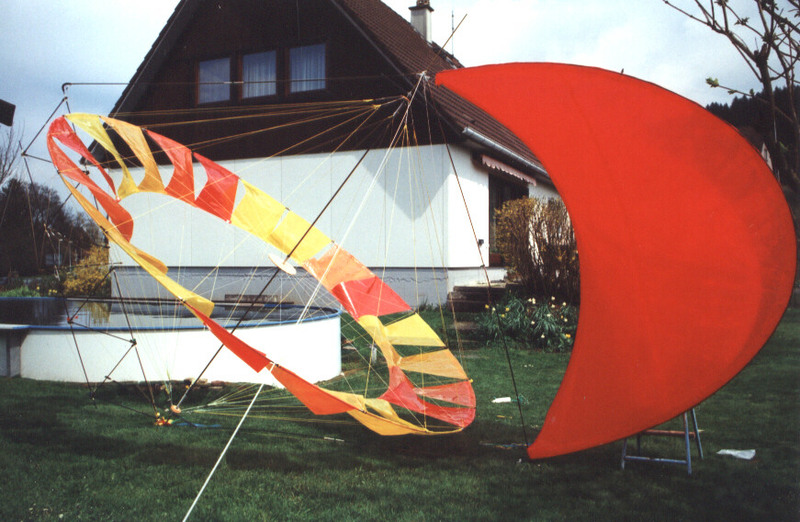 I even wanted before a while to build a quadline stuntkite, and so I built the new kite as a four-liner and I tried to fly the kite. Because I never flew four-liner before, I could not say whether it is up to me or to the kite, but it was more on the ground than in the air. But then came the expected material, and the four-liners was put in the cellar. Meanwhile moved the deadline for the German Kite Championship ever closer. 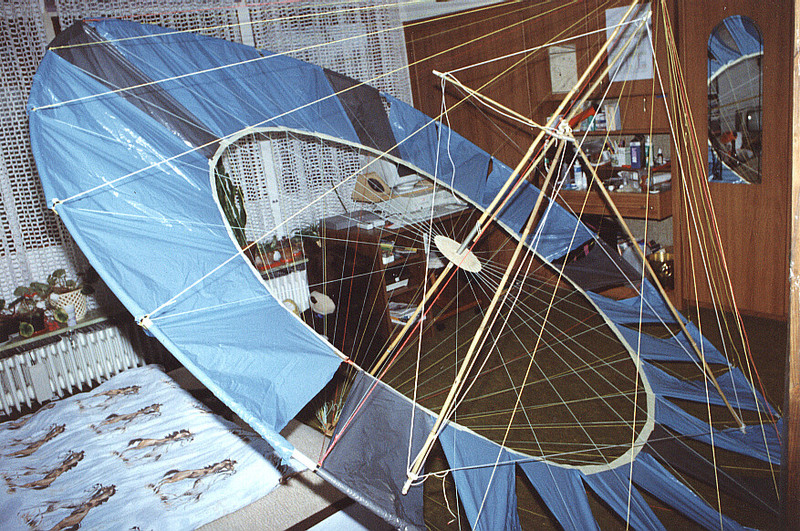 I wanted to start with the smaller singleliner or with the kite, I have just under construction, if it flies. 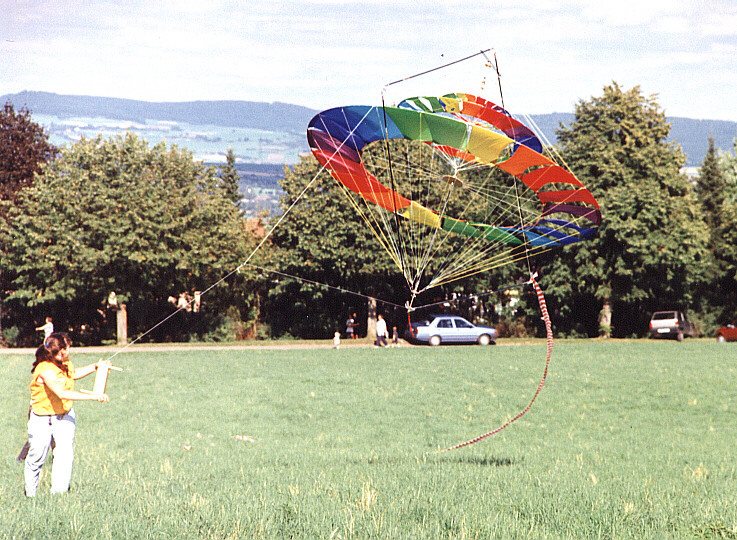 However, I had no idea in what class, but this was easy to clear by a call to Ralf Dietrich: The kite fits best to the open class, but if it would have several levels, it would be a box kite. Then the idea came to me to build the big dragon with multiple layers, which should also improve the flight characteristics, because the individual rings rotate in the opposite direction. So I booked for these two classes, hoping that the great kite would fly until then. With the increase of the vertical wing I have got huge problems with the material: Carbonfibre was too brittle and fibreglass too soft or too heavy. I tried some other shapes, but all disturbed at the start. During a flight test at a festival, I was angry with the wing, so that I just removed it and tried to fly without it. The kite was, surprisingly, relatively stable, but not enough for flying. One of the kiteflyers just had a long ribbon, and we fixed it as tail to the kite. Now it flew stable. I still do not knew why this kite flies without the wing, all my previous kites needed it to fly, but the main thing was that it flies. Now I had quick to sew a better tail, because in a few days started the championship. There was the weather not good for my kite. It was continuous raining, and some parts of the bearing consisted of wood, which became wet and moved bad. The wind showed me a few points which I should soon increase. But the kite flew at the right moment and got the second place. 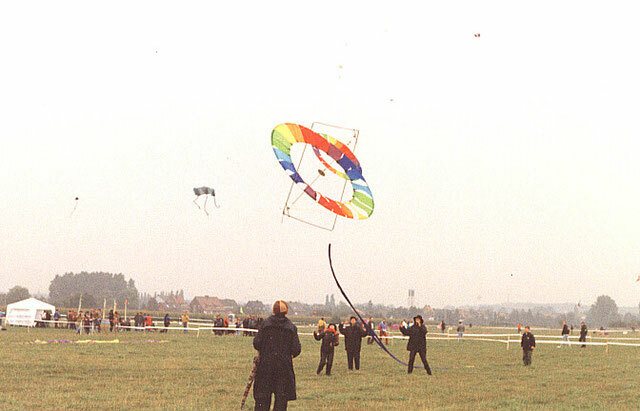 The smaller kite managed a sixth place. At the second day of the championship I thought I could have a little rest, because it was the day for the stuntkites. But that changed quickly, as I practiced a little with my new four-liner. 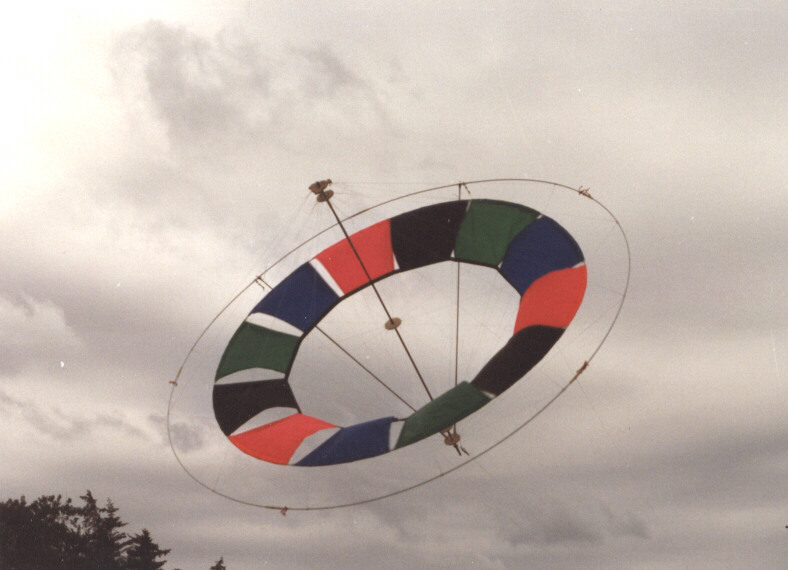 Uwe Gryzbeck was curious when he saw that this four-liner was able to do some new tricks because of the four rotors. It could roll for example like a bicycle on the ground. The whole thing ended so that he practiced about 10 minutes and then took part on the four-liners competition. The spectators were enthused, but the jury could of course only value the performance of the pilot and not the novelty of the kite. At the time I am still trying to improve the flight characteristics of the kites and to adapt them to different wind strengths. Let's see what these shows new.